FMSC exists because of volunteers just like you who generously give their time and energy to feed starving children in desperate need around the world. 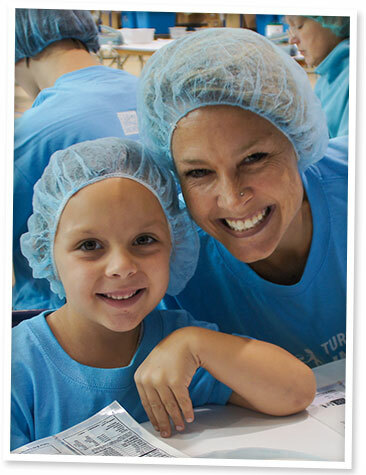 YOU are an essential part of FMSC. FMSC doesn’t use machines to package our meals because we realize the personal, impactful experience created by packing the meals by hand. It transforms an experience from just “something good to do” into something deeply personal. FMSC volunteers experience a fun, one-of-a-kind team building experience with co-workers, family, friends and strangers alike. This experience often turns into a desire to do more and reach farther, until all are fed. Experience the incredible joy of turning hunger into hope with your own two hands. Experience a genuine and meaningful service opportunity. Learn what hunger looks like. See first-hand the stories of precious children whose lives have been saved and given futures filled with HOPE because of the nutritious meals YOU hand-pack.